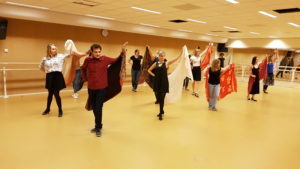 On Saturday 21st of October, our very own Belgian Treasure had the delight to give us a Flamenco workshop! As this was her long-lost love, she dedicated herself dearly. We showed up with our vast collection of scarves eager to begin, but were rightly first explained what Flamenco truly was, how the music can have different beats and what to listen for. As soon as the thrill dawned on us for what we were in for, we stood in lines, and did our best to follow a tricky but beautiful string of movements using the full effect of our lovely adorned cloth. It was just tricky enough to be challenging, and yet easy enough for everyone to follow. Something that had to be justly so, as our beacon of dedication Manon had spent three hours that same day leading up to the workshop rehearsing all, of both the male and female steps, of a choreography of her own making after weeks of careful choreographical deliberation. 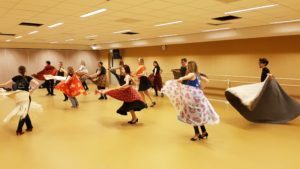 During the workshop we also welcomed a very special guest: one of the members of our sister association Blue Suede Shoes from Delft. We hope that they will also join us in the future and we sure will visit their upcoming activities. There was however one particular enthusiastic board member that shed his scarf in favour of a beast of a cape, any discomfort was countered by a sudden refreshing whirlwind blasting through the dance room without the use of one of the monster fans. Ultimately, a real success! Have you enjoyed the workshop and do you want to see how it looked like? Ask us for the video’s.